“English” is considered to be the most important language, not only for communication but also for studies, business & tourism around the globe. But are you really aware of this that hardly people from some parts of the world like Asians, Africans do not have knowledge of English at all? Yes, it is very troublesome to cope up with the hard situation of illiteracy in English. So you too are sailing in the same boat as the ones who are ashamed of their poor quality of English? Time to give up such hopelessness.Here comes a magical charm to erase your illiteracy and enlighten you in the knowledge of English language. This program is referred to as “the ESL program in the New York City”. “ESL” stands for “ENGLISH AS SECOND LANGUAGE”. You can learn English within a very short time from highly qualified scholars of the language. The location of the course offered is at the center of Manhattan. There are various schools offering such a course. One such significant school offering the course is the “UCEDA School”. Beside these, they are several other institutions at different places devoted to the particular task of literating people through ESL program. These include Bluedata International Institute, Manhattan languages, ESL language centers, ALCC American Language. These are some of the renowned schools. Such schools are best for training the newcomers who do not even any knowledge of English. The school has well-qualified teachers offering the course over 25 years. The mission of such schools is to provide their best efforts to teach proper English to the students of any part of the world as well as to the local students. There is nothing to be felt ashamed for a poorer English. Not everyone is qualified with the same qualities. Had English been the language of the world, there would have never been so many linguistic groups. So, don’t be late to join this program. You can stand at par with those native spoken people by studying ESL in New York City`. There is a basic curriculum set for the students which offer the course in a very systematic, grammatical way. Moreover, the best part of the course is that the courses are authorized by the New York STATE EDUCATION DEPARTMENT. The courses under the ESL schools include Dual language, Bilingual language education, ESL Pullout, Sheltered English Instruction, Structured English Immersion, Heritage Language. The students can choose to study with any of the above. The classes usually begin on every Monday. The facilities provided to the students with Wi-Fi hotspots, modernized classrooms, with wide projector screens. There are two levels at which the classroom coaching are held. They are the Intermediate level and advanced level. The intermediate level focuses on presenting the only basic idea of a thing while the advanced measures the depth of knowledge about that particular thing. 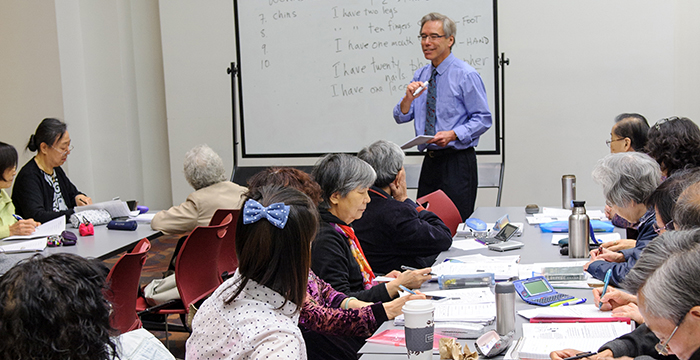 There are a total of 20 ESL classes a week with semi-intensive programs which comprise of 16 hours in a week. A rental system is available to the students in the form of hostels which provide them an easy access to their nearby schools. The students are taken on regular excursions for having a first-hand experience of the subjectand interacting with people to progress more in spoken English. There is a certification registered with the government for the course offered to the student which is one of the significant points in the course. You can get your best results by studying ESL in New York City. The main motto of the course is that it gives you a super homely environment, devoid of any kind of bully in a very supportive manner which is the most expected criteria for many of the students. These programs have already faced great clients ranging from international students, who always have been finding an option to enhance their English, advancement in their profession and also to meet up their personal enrichment. The ESOL classes that are arranged help in the improvement of English listening, speaking, writing and reading capability of the students. The course is available to both a national as well as overseas student. Students who have been interrupted from a continuous educational period. There is no need for special degrees. Eligibility declaration formalities will be done by the principal of the school. By studying in the world’s best democratic state, one is free from scars of social or racial discrimination irrespective of the cast, color& creed. All you need to do is just to register for the best ESL class you want to opt for. There are many courses ranging from Accent reduction, English for continuing business, Literature, and so on. Just go through the list and choose the one that suits you. You will be finding an environment of a large number of friends from different parts of the world who are finally tied to you, with the same dream of having an improved knowledge of English. The payment of the course is a super affordable one which is only $490 for a 4-week course. The teachers offer the course by first planning out the session. The first step is to motivate the students by making them focus on the point that they are attending those classes just with the objective to learn the best English. Next, the teacher gives a brief introduction about the actual framework of the classes. They present the topic to the students both theoretically as well as practically by means of audio and visual implements. Finally, after lots of interactive classes, regular tests are processed till the candidate finally appears for a final examination. This format of learning is so super easy and find that the candidate will never feel a condition of being overstressed. There are no study pressures, with fewer home works and more class works. There are video sessions on Life skills reading, Problem-solving techniques, cooperative learning, narrative reading, etc. Lots of reviews have been collected and it has been finally concluded that to some of the students, these courses have proved to be the best meeting up their expectations. They have improved their vocabulary to their knowledge to such great extent that is getting easy access to any of the MNCs or any of the companies offering business. So doesn’t that sound really positive? Every year such schools have produced best 100 students who have proved the world that having a poor knowledge in English from birth is not at all a matter of shame, rather they feel proud and pay gratitude to such schools who have helped them so much in chasing their dreams. Everyone desires to get a lot of respect and prestige from the ones surrounding him. Communication skills are that important point that determines the amount of prestige. But it is not always that easy to have a potential about everything. So, in order to make us that capable, we need to learn. Learning is never a matter of shame no matter what your qualifications are. There is never a boundary to the knowledge we gain each and every day. English is a very basic language. Once you find yourself comfortable in interacting with people all around you, you automatically feel a shooting inner confidence in you. All such schools built with a motto of lending a helping hand to you are there to take care of you. Just don’t let yourself feel low about what others will be thinking about you. You are doing a positive thing for your betterment. Be confident and move on. Once you are on the peak of a successful knowledge, no one can pull you down. Learn your best, enjoy your best now at New York City with the ESL learning classes.